Everyone knows that Milan is the fashion capital, but what are the shopping streets that you should not miss? It really depends on the type of purchases you want to do! Below there is a mini guide that will be very useful to all fans of shopping, in view of the runway shows in Milan (to be held between February and March). If it is true that all depends on the type of shopping that one decides to undertake, wether it is economic, casual or luxury, it is likewise true that in Milan there is a neighborhood that has become an institution for fashion victims: we are talking about the fashion district. It is a neighborhood where there is a very high concentration of boutiques of famous or emerging brands, jewelers, showrooms (including furniture showrooms). So named because ideally bordered by four streets become famous thanks to the many shops and showrooms of the most important names of the fashion world. The heart of the "Fashion District" is Via Montenapoleone, which is the sixth most expensive and prestigious street in the world according to the index “Main Streets Across the World ", which classifies the most expensive shopping streets in the international level. In addition to Via Montenapoleone, which is the beating heart, the "Fashion district" also consists of Via Manzoni, Via della Spiga and Venezia Avenue. In this area you can also find many other very important streets for your shopping in Milan. Avenue Vittorio Emanuele II: perfect for classic and casual shopping and for a walk in downtown Milan, with its pedestrian zone, arcades and the Cathedral (the Avenue connects the Cathedral Square with San Babila Square). Here are plenty of clothing stores, also suitable for young people and not necessarily expensive: low cost warehouses next to more famous brand, with proposals suitable for everyone. Via Montenapoleone is the luxury shopping street par excellence. Here you will find the major international brands. Haute couture boutiques and jewels: here you can find everything and during the runway shows you could see celebrities and models strolling. 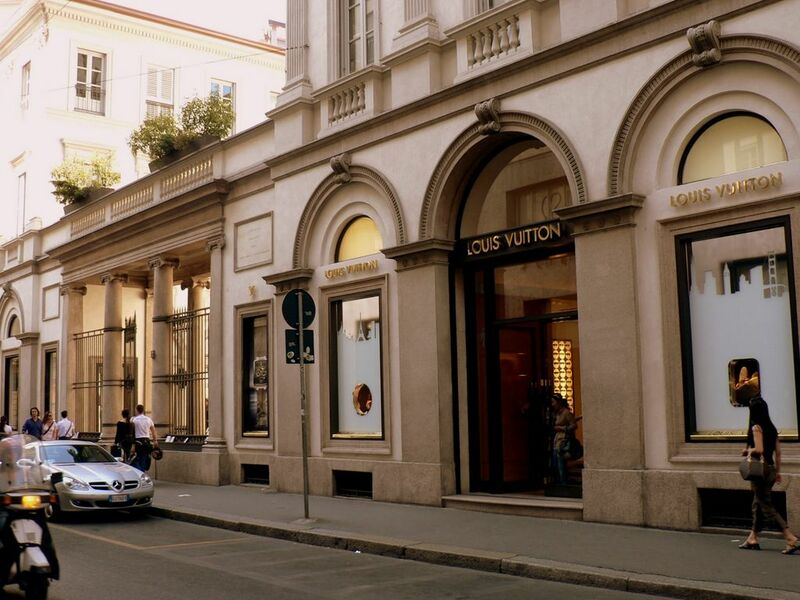 Via della Spiga: other street dedicated to the elite shopping, in this street are the best brands of the fashion world. Via del Gesù: a street smaller than the previous ones, here you can find the ateliers of fashion designers renowned internationally and stores dedicated to Italian craftmanship. This Avenue connects San Babila to Buenos Aires Avenue, here you can find a lot of fashion shops. Buenos Aires Avenue: more than a kilometer of shops that can meet all the needs, here you can find everything; clothing, books, jewelry, shoes, sporting goods. Via Torino: another very important street that connects the Cathedral Square with the Navigli area. Here say that the level of shopping is much more commercial and more suited to young people. Porta Ticinese Avenue: alternative and a little more casual shopping, with original shops ... if you are looking for niche showrooms you can find them here. In this area there are vintage and ethnic shops as well as dressmakers that make custom clothes. Via Savona: this street is dedicated to design, photographic studios and a pretty unusual and curious shopping. Whether it is luxury, young, alternative, ethnic or niche shopping; the city of Milan will not surely disappoint any fan of shopping, guaranteeing a five star experience.